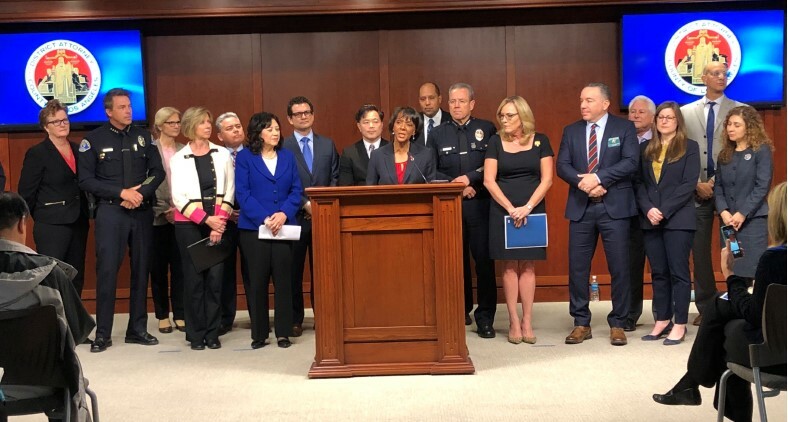 LOS ANGELES – Los Angeles County District Attorney Jackie Lacey on Wednesday announced the launch of a mental health division — the first of its kind by a prosecutor’s office in California and possibly the nation — to seek opportunities to expand treatment and other services for mentally ill inmates in the criminal justice system. “Obviously, with some of the people who are mentally ill … those folks have to be in a secure setting such as a jail and receive their treatment there because they are dangerous. But there are a number of people in a number of cases that we have encountered where they do not display those violent tendencies,” the county’s top prosecutor said. The district attorney noted that she doesn’t want to be asked to divert cases involving serial killings, but said she believes there are lower-level cases that would be eligible. The new division will work with defendants who have been declared mentally incompetent to stand trial or who are seeking alternative sentences due to their mental illnesses, according to the District Attorney’s Office. Prosecutors will be encouraged to “make courageous decisions and do the right thing,” Lacey said. Among those on hand for the announcement were Los Angeles Police Chief Michel Moore, Los Angeles County Sheriff Alex Villanueva and three county supervisors. Supervisor Janice Hahn — who called it an “historic day” for the District Attorney’s Office — said prosecutors working in the newly created division will undergo training from the county’s Department of Mental Health on the intricacies of working with people who are living with mental illness. The Mental Health Division will serve as a resource to deputy district attorneys faced with questions about potential diversion cases and motions made under Senate Bill 1810, the new pre-trial mental health diversion law. It also will provide training to attorneys and first responders; advocate for more community-based mental health resources; and pursue legislation to enact meaningful criminal justice reform in California. Since her election in 2012, District Attorney Lacey has worked to address the needs of those with mental illness. She formed what would become the county’s Mental Health Advisory Board with mental health and criminal justice professionals in 2013. The advisory board created its “Blueprint for Change,” a 2015 report that mapped out a path to address issues within the mental health and justice systems. In response to its recommendations, Lacey has provided free mental health awareness training to more than 1,400 first responders from smaller police agencies. The training shows first responders how to safely de-escalate encounters with people in a mental health crisis. In 2016, Lacey appointed the nation’s first mental health liaison for a local prosecutorial agency. The liaison worked in collaboration with a variety of stakeholders to address ways to safely help people in a mental health crisis stay out of the criminal justice system. 1 comment for "LA County DA launches Mental Health Division"
Senate Bill 1810 is a dream come true for defense attorneys.